Three months ago, the Great African Caravan embarked on what can only be described as an epic African Odyssey. In collaboration with local organisations, an international group of artists and activists will traverse Africa to address issues in the framework of UN Sustainable Development Goals (SDGs). Travelling from the wide blue expanse of Table Bay to the burning waters of the Nile, the Caravan will host performances, workshops and dialogues to explore pertinent and locally identified themes. Together with partner NGOs and artists, the project aims at fostering intercultural exchange and empowerment through the agency- and peace building capacities of art. Participating communities are invited to partake in artistic expression and reflective discussion to articulate their identities, cultures, social and natural environments, political realities and the tensions that exist in between. As such, the Great African Caravan is an exploration of the idea of a borderless world. It aims not only at the crossing of 12 national borders but will ultimately venture to question the boundaries and divisions between individuals and communities that are creating barriers to the cooperation and creativity needed to realise the SDGs. To do so, it is important to tackle the divisionary and oppressive mental boundaries of colonialism and acknowledge the colonial heritage that the geographical and symbolic itinerary of this project has inherited. Long before the Caravan team first envisioned this project, the plan of connecting the two extremes of the African continent through a Cape-to-Cairo line had been a deeply cherished ideal of key imperial figures (especially mining mogul Cecil John Rhodes who once governed the Cape Colony and founded Rhodesia, now Zimbabwe and Zambia). The ideal of a borderless, universal British imperialism stretching over the North-South axis of Africa has therefore figured prominently in the popular imagination of British colonial rule and perhaps signifies the very epitome of the totalised colonial vision. Hence, the unfulfilled dream of a telegraphic and railroad “red line” running from Cape Town to Cairo marks not only the colonial desire for full control over territory, its resources and its mercantile potential but also its people. The fantasy of “unlocking the dark continent” through the Cape-to-Cairo line also became a route for itinerant ethnographic expeditions and exhibitions of African peoples locked in an imaginary time capsule that was deemed “unhistoric” and barbaric. Travellers and officials attempting the arduous journey would enact the colonial script starring the triumph of European modernisation and civilisation over the untamed and wild masses of African lands and peoples. Hence, their experiences became reiterations of the omnipresent motif of overcoming the African through the Cape-to-Cairo trajectory. Landscapes became mere backdrops to colonial conquest and people became type-cast extras to the imperial odyssey. 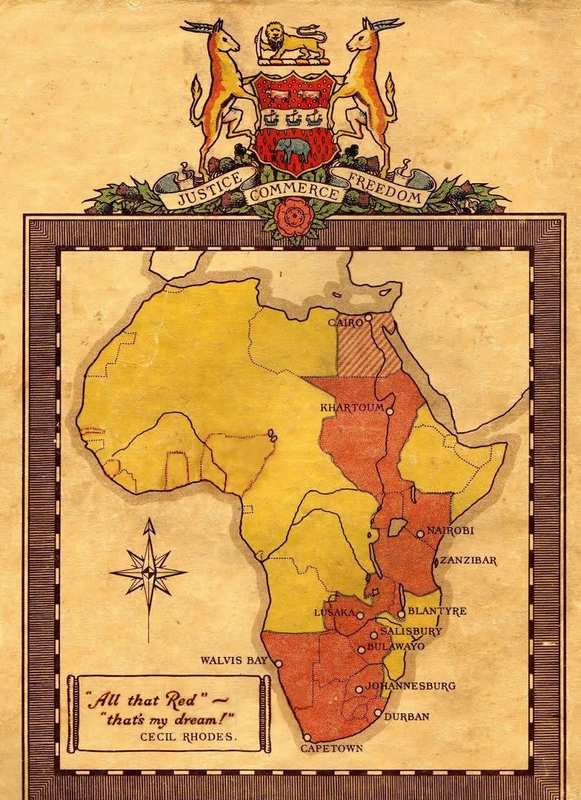 One of the most potent reasons the “red dream" was not fulfilled in colonial times, however, is the fact that the African axis concerned is, and always has been, so much more than what the imperialist gaze perceived and reproduced. The Great African Caravan is therefore passionate about subverting the original meaning of the Cape-to-Cairo route because its project is decidedly antithetical to the imperial dream. Instead of envisioning a universal British imperialism it strives to promote the idea of a borderless world that respects indigenous African cultures and sovereignty, both national and personal. Art will play a pivotal and bridging role in creating such a world because it establishes connections between people through the expression of histories, epistemologies and experiences that have been marginalised for an unconscionably long period of time. Through respect for diversity and difference the Great African Caravan therefore espouses a radical reconfiguration of the meaning of the Cape-to-Cairo itinerary in the imagination of all its participants.